The UNM Alumni Association returns a longstanding tradition—the Homecoming Kickoff Rally at Hodgin Hall. All members of the pack are invited to reignite and rediscover their Lobo spirit from 11 a.m. to 1 p.m. on Monday, Sept. 25 in the Karen A. Abraham Courtyard. The rally is for alumni, students, faculty and staff. Cherry and silver attire is encouraged. Lobo Louie and Lucy and the UNM Spirit Marching Band will be there to help kickoff this year’s festivities. Food trucks will be available to purchase lunch, including the Supper Truck and Kimos Hawaiian BBQ. Staff Council will be providing ice cream for dessert. Faculty and staff will be able to pick-up their Faculty & Staff Alumni Luncheon tickets at this event. Full-time faculty and staff who are alumni are invited to the annual Homecoming Appreciation Lunch at noon on Wednesday, Sept. 27. Space is limited to the first 300 guests, so be sure to pick up your ticket in advance at the Homecoming Kickoff. Tickets will be given out on a first-come, first-served basis. You must have a Lobo ID to receive a ticket as reservations will not be accepted over the phone. New this year, faculty and staff are asked to bring items to the luncheon for a table decorating contest. This year’s Homecoming is a celebration of the Lobo life. 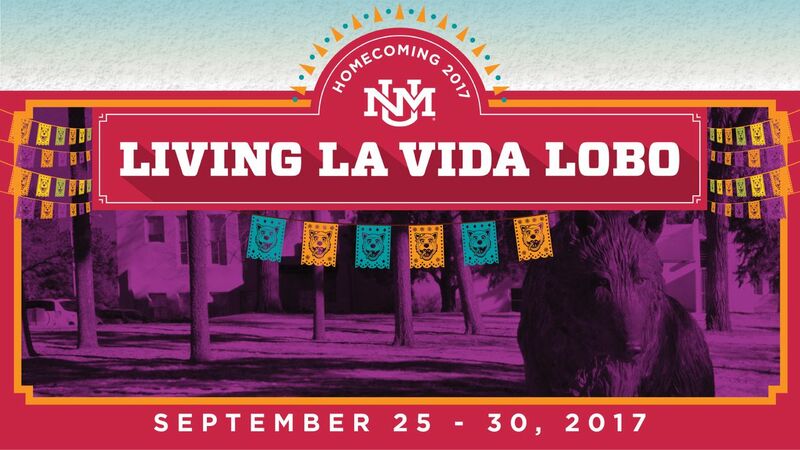 The Alumni Association hosts Living la Vida Lobo during Homecoming Week: Monday, Sept. 25 to Saturday, Sept. 30. With more than 50 events on the calendar during Homecoming Week 2017, there will be an event, lecture series, reunion, open house or tailgate opportunity to fit everyone’s interests. A full schedule of events can be found by visiting the Alumni website.